You work with what you’ve got | Where to next? 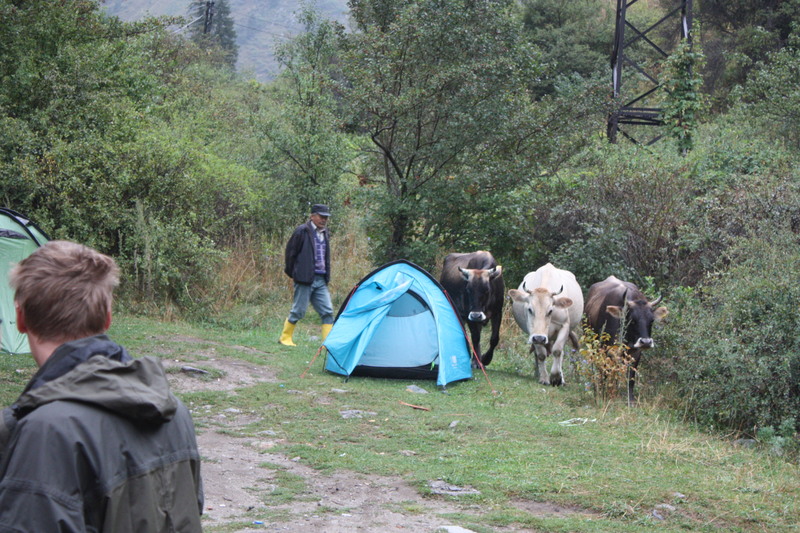 Glen does a double-take when the cows come to call at our campground on the outskirts of Almaty, capital of Kazakhstan. Overland travel isn’t about hardship. It’s about enjoying the adventure, accepting the unexpected and being creative so you can make the most of lots of different situations. Some of the bush camps have been great, some have been dismal. It’s easier to accept your surroundings if you consider how hard it must be for the driver to find a clean and level-enough place that will hold the truck, our spread-out bush kitchen and about 15 tents. Sometimes we have to work around rocks, thorns, poop, broken glass and garbage. Indoor accommodation and campgrounds have been up-and-down too. Sometimes they are clean and comfortable, sometimes not. Hot water and electricity can be variable and toilet paper is usually bring-your-own. We’re almost always pretty scruffy. We can have showers and do laundry from time to time, but when you are on the road for eight or nine days straight, you realise it’s a good thing you all smell pretty much the same. I was proud of myself at our homestay in Bishkek, the capital of Uzbekistan. It had one toilet and one sink, but there were two hot showers, so I decided to colour my hair. I wanted to look in a mirror to apply the colour, but there was a girl washing her clothes in the sink—under the lone mirror and sign that said ‘no clothes-washing in the sink’. So I stood in the driveway instead and used the car windows as a mirror. Not bad considering the car was a Lexus! Having enough water for drinking and cooking is another challenge. The truck’s water tank holds 500 litres, but the trick is to find water that is clean enough, when treated, to be drinkable. Service stations often have good supplies of water, as do many villages. But sometimes the pressure is so low, that it might take us three hours to fill. In those cases, we drive on. On occasion, we have had to cart water from creeks and distant rural pumps. We do this with big plastic buckets and look rather like an amateur fire brigade. 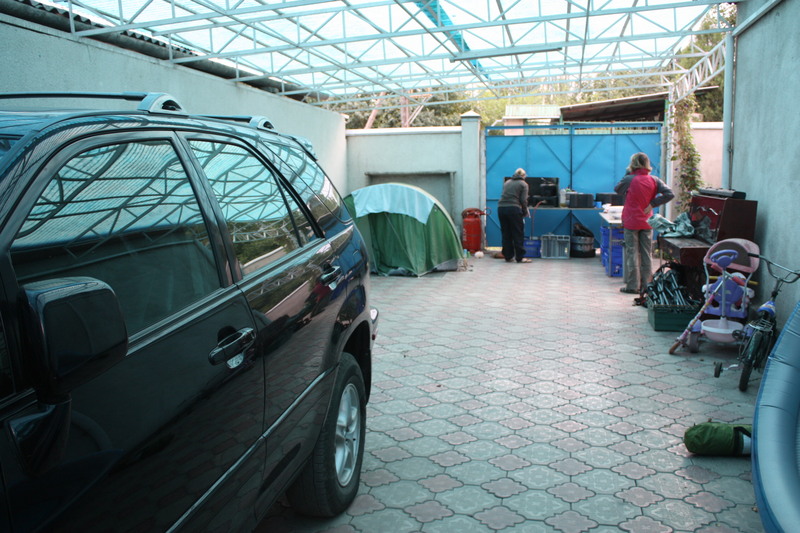 A well-used driveway—a Lexus, our tent, a makeshift camp kitchen and the kiddies’ playthings. A few days ago, we had a mishap. We were filling from a restaurant hose. The water started clean, but ended up running diesel into the tank. In seconds the whole tank was contaminated and the water was black. It’s been drained, rinsed, cleaned with disinfectant, rinsed, cleaned with dish detergent, rinsed and refilled. Of course, then all the water was chemically treated. The coffee drinkers think it tastes funny, the tea drinkers think it tastes okay. Poor John has been the unwitting guinea pig. He had a few unboiled gulps before being told he probably should wait until the tank has been drained, cleaned and filled again. He’s fine, so I guess we can risk it for now. NOTE: If you’re hungry, be sure to check out my recipe blog.